Hellotxt has been around for some time. I used to use the service a couple of years ago when it was nothing more than a single-point distribution akin to Ping.FM. However, as time has gone by and Hellotxt has matured, what it has turned into is something far greater than how it started. Firing up Hellotxt, you’ll see a screen with 4 options – Post, Feeds, Outbox and Networks. Now, you’ll need an account from Hellotxt in order to use the service, but that’s a pretty simple signup. Once you’re signed up, you can add networks to your Hellotxt app on Android. From that point, you’ll have a single place where you can wach and interact with Facebook, Twitter, Posterous, Blogger, WordPress.com and many more. Now, about the engagement features. First off, you have what Hellotxt calls a “Smart Feed”. Your Feeds section in the app allows you to comment, Like, Retweet and essentially have full interaction with your Facebook and Twitter feeds, just as if you were using the site. There’s also a location feature and the part that I love most – Doodle. You can choose to create your own Doodle, Doodle over a Map, over a Gallery photo or even take a new picture and Doodle over that. While there are some good use-cases for Doodle in being productive, it’s more about being fun, and in that sense it does a great job. 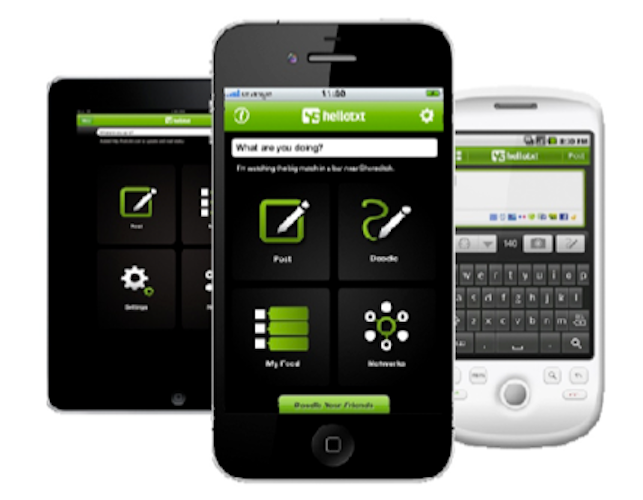 Hellotxt is free, and available now in the Android Market. For those of you on iOS devices, there is an update that should be coming soon, and we’ll let you know when that hits. Speaking of hits, is Hellotxt a hit or a miss for you? Personally, I love it, but I’d also love to hear your thoughts in the comments.